This week, Dave's been away on a business trip. Sabrina, Max and I miss him, but we've had ourselves a good time both at home and on outings for school clothes and chocolate milkshakes. When the kids were young and Dave wasn't around, though, I'd get nervous about being alone with them. I worried Max would have a seizure, and I was scared of juggling both of them; Max needed a lot of extra TLC. For years, I'd rarely go out with the kids if Dave wasn't by my side. I felt like such a weenie. Before I had children, I was pretty intrepid; I genuinely liked to do things on my own. I traveled in Europe alone, I'd go to movies by myself—I felt like I could do anything I wanted to. The world, as they say, was my oyster. That feeling clammed up once I had Max. I was so thrown by what had happened, so insecure about my ability to take care of him. The tremendous responsibility of trying to help a kid with brain damage develop weighed heavily on my head and heart. I'd marvel at the moms I'd see at the mall or in the park strolling around with their kids. They looked like they knew what they were doing. I certainly didn't. I was terrified of mothering my own child. As it became more apparent that Max's muscles were stiffening, signs of the cerebral palsy, my can-do spirit would stiffen up, too. At times, I felt paralyzed by fear. There were nights when Dave came home from work and I would hand Max to him, go to our room, curl up in a ball on our bed and sob. It wasn't just grief; I felt so helpless. Max had two seizures, a grand mal when he was almost two, and a petit mal at 5. They were nightmares come to life, but we got the seizures under control with medication. Me, I probably should have gotten anxiety meds back then, but never went that route. The years passed, Max progressed and my strength and spirit rebounded. These days, I don't think twice about being alone with the kids or taking them out without Dave. Granted, there are places I still won't go with Max alone, like fairs or anywhere crowded, because he wigs out. But I am no longer scared of being his mom. Have you gone through that, too? Saturday morning, Max and I will be at the GoGo squeeZ Free Play Zone in New York City's Foley Square. It's open from 7 to 1, part of the Summer Streets event, and there will be activities and crafts. Max is an applesauce fan, and they're sponsoring posts. We'd love to have you join us. I was thinking about something similar to that this morning. My wee guy is 22 months now and I was thinking about when I first bought him home from the NICU with oxygen and feeding tube. I was so scared that if I left the house his oxygen would stop working and he would die. The first time I took him for a walk to the end of the street was a real achievement. We still don't go far because if he catches any bugs he requires hospitilisation, but the fear of something terrible happening while we are out has almost gone now. It's reassuring. Like everything will get easier you know? I was scared to be alone with my child mostly after the month of NICU - the neonatologist told me that she "could die suddenly at any time", and I did not want to be alone if that happened. Scared. to. death. But she defied a lot of negative expectations. I did accept the anxiety and sleep medications for a period of time, since I could neither eat nor sleep, and lost 80 lbs with no effort whatsoever! I must have been shaken to the core. I have 2.5 year old twins with autism (and a 1 year old) and I never leave the house unless I have help or am going somewhere I have help. The possibilities of one of them bolting is just too great. Just the thought of juggling all three of them into and out of their speech and OT gives me the shakes. I think I'm going to break out the backpack leash- I have to do it something, I can't have someone with me at all times. I did not imagine motherhood to be like this. We've got memberships to museums and splash pads and we never go. Not what I imagined at all. I had no choice...I have 4 kids, and when I got my "new normal" life (my 4th was diagnosed with a heart condition, went into severe septic shock, then brain damage)my kids were 9, 3, 2, and 4 mos old. then 2 years later due to lack of work here my husband moved to the Middle East to support our family and growing medical expenses (we were self employed with crap insurance). So no, I have no choice. I go to the store with 4, I go to the doctors with 4...even to make sure I am still a girl..., everywhere I go, 4 go with me. it gets hard when the youngest gets admitted, I pull out all the favors (she has been admitted 28 times). I think you do what you need to do, when my husband is home (he is away 300 days a year, so not often)I do soooo enjoy my alone time. It felt good to go the the bank today, alone! Mama Kat, I think you have given me (and probably every other parent who reads this blog) a whole new perspective. Whoa. And, wow. You could teach all of us a few things. Slacker Mom, you do what you have to do. Cushia, how unnerving to have to worry about an oxygen supply. I feel your relief that your fear of Bad Things has dwindled. Rebecca, I'm guessing that many moms of babies without issues experience freakouts, it's all new territory. And it's all relative. Kate J: What an absolutely terrifying thing to have heard from a doctor. I can't even imagine. As it was, I used to have Max sleep next to me and I'd lie awake and make sure he was still breathing. Totally get what you are saying even though I come from different circumstances. When my husband died I was not in a good place because he really did have my back and share the load. I never worried because I always had that reassurance. My youngest's CP is mild and my oldest has developmental delays but is pretty physically fit, all things considered, so we never went through seizures or medical emergencies of that type (though we did deal with stuff like my oldest trying to throw my youngest downstairs because he wouldn't give up a toy--moving to a ranch house helped that situation quite a bit). My biggest stressor aside from the total "alone-ness" was child care when they were littler and I had to work strange hours. My parents were champs but there was a lot of back and forth between houses which was a pain. Now we're all under one roof and I couldn't be happier. I sometimes feel bad because I do lean on my folks alot, but they tell me that the little farts keep 'em young and useful, which eases the guilt a bit. I'd love to run away to NY, but I think I am working a 3 to 11 shift on Sat, damn the bad luck! Oh yeah, definitely in the beginning before we even know he had any delays I was terrified to be alone with him even in the house. So yeah I think all first time moms experience this but yeah then add in anything else and I would have been a basket case. He is still not the easiest kid to take places, doesn't like to hold my hand, but I do it. Other kids, I would take anywhere on my own. 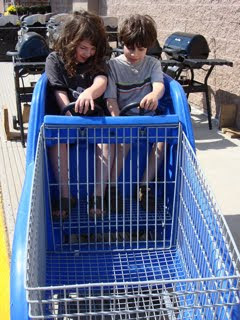 I have gotten better about not letting our kids' special needs slow us down. We've enjoyed many local parks this summer as well as our library and the museum... but my son is getting more difficult to control period, but especially in public. I'm not a fan of dealing with a screaming four year old with an audience. I don't know how to work through this phase... God I hope its a phase. Your post resonated with me, even as a mom of a typically-developing child. I could barely even get it together to go to our Mothers&More new mom's group. Then when my daughter started having febrile seizures (at the slightest temp increase) at 17 months old, I could barely bear having her out of my sight. Even now, with seizures becoming less frequent, I go through spats of worrying that she is having them at night and I don't know, or that she will have one when I am not with her(again). Then when I started to read all the comments, I was completely humbled by all your other readers. You are all such amazing moms!! I learn so much from you, both as a mom and as an early childhood special educator. Thank you. Yes, yes and yes. Pacey came home from 8 weeks in the NICU with oxygen and a feeding tube. Having had an early birth, several scares in the NICU and the unexpected diagnosis of Ds, I felt completely underprepared and terrified of being his mother. If I'm going to be really honest, I don't think I actually became his mother until we got through that first tough year that felt mainly like caretaking/monitoring development/endless specialist appointments/hospitalizations. I absolutely love your line about your spirit and strength rebounding. I wouldn't even leave it at that...more like multiplied exponentially. Oh gosh, I still have to fight the nerves when I take Lily out by myself. I start talking to myself - "It's OK. You're a grown woman and you can do this. It's just Target, for crying out loud. You can do it." Mama Kat - You are the WO-MAN and I am a wimp. I can't say that I've ever felt that way, but then again I am in a different situation and I don't have a child with Max's needs. My special needs son is pretty "easy" to take places (unless that place is somewhere he needs to be quiet LOL). Lately my two "typical" kids (ages 11 and 8) have been more of a pain to take places, but I think that is a parenting problem on my end. LOL again. Also I think you do what you have to do. I was widowed when I was pregnant with my second so I had not much choice in the matter (I later adopted my special needs son). But again, my two bio kids are neuro-typical. My real reason for commenting (other than to tell you that I REALLY enjoy your blog) is to say "hi" to Felicia and let her know that there are other young(ish) widows out here. I live next door to my parents and they are a TREMENDOUS help. I am so thankful for them. I was afraid to go out to parks with my kids after Rowan was born. I was convinced that someone was going to try and kidnap one of my boys. If the ice cream man showed up, I was out of there. And I was afraid to care for them by myself if my husband had to go out of town. Rowan came home on phenobarb and since he was an identical twin I was always double and triple checking I was giving the right twin medicine. We painted all of Rowan's toes black and then I had to write down ...the one with black toes gets the medicine. I ended up on anxiety medicine. completely going off topic to say that I heard about Gogo Squeeze for the first time about half an hour ago! I am very interested in trying that stuff out. Really appreciate the words: It wasn't just grief, I felt helpless. I can really relate, nothing worse than that feeling (IMO). I have felt the same thing with my 3 kids. When Ash is not feeling her best, having problems walking, & after Ethan was born (my 3rd), I stayed home a lot. Tomorrow is the first time ever I am going to our zoo on my own. I have always had my husband or a friend with me, but we are going to see the baby penguins. I just hope Ash can handle the walking & her pain. I have her meds packed. I also hope I don't have too much pain, too. I am glad you posted this because I realized it is time to do this on my own. I made the decision before I say this. Wish me luck! Did I tell you that Ethan is 2? Thank you for sharing. I can't imagine your fears but can imagine your joy at being able to take your children out on your own. Congratulations.